You always crave the foods you must not eat, right? No, ... a recent study finds decreases in sweet and starch cravings in obese individuals on low-carb diets. If the calorie intake is standardized, low-carb dieting has no proven metabolic weight loss benefit compared to any other dietary weight loss intervention. In the real-world, as well as less tightly controlled studies in obese individuals, however, they tend to outperform their American Heart Association inspired bogus low fat, low protein, high carbohydrate counterparts. The reason? No, still no "metabolic advantage": reduced hunger and food cravings and the subsequently increased adherence and reduced energy intake - an assumption that isn't proven, but at least supported by Colette Heimowitz' latest paper. A paper based on a study that was sponsored by Atkins Nutritionals and smells of bias, but a study that's in line with millions of N=1 reports on the internet. "[f]or the next 2 wks, subjects prepared their own meals with the goal of achieving a similar food intake. Subjects were surveyed regarding reasons for enrolling in the program, and at baseline (BL) and 4 wks, completed the Food Craving Inventory (cravings for foods that were fatty, sweet, high in CHO (starches), or categorized as fast foods), and the Three Factor Eating Questionnaire (TFEQ) to assess food intake motivation" (Heimowitz 2017). All N=20 subjects (10 men and 10 women with a mean age o 40±8y, and a BMI in the red obesity zone of 34±3 kg/m²) completed the study with their main goal being to look better - not to be healthier, which ran as a poor second, along with family issues. Figure 2: Plot of the most relevant anthropological and psychological study outcomes (Heimowitz 2017). Over the course of the intervention, of which you should by now have realized that its non-controlled nature significantly reduces its meaningfulness, the subjects lost a highly significant amount of bod weight (5.7±0.6 kg, P<0.00001) and, more importantly, were able to reduce their waist circumference by 5.6±0.9 cm (P<0.00001). Unsurprisingly, "subjects stated that consumption of [the authors' company's] pre-made meals aided them in meeting their weight-loss goals" (Heimowitz 2017). 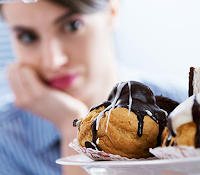 With regard to the underlying research question, the scientists' statistical analysis of the data from the questionnaires, the authors observed a high baseline craving for sweet foods (45% of subjects reported frequent cravings for sweets) that did not increase with low-carb dieting. 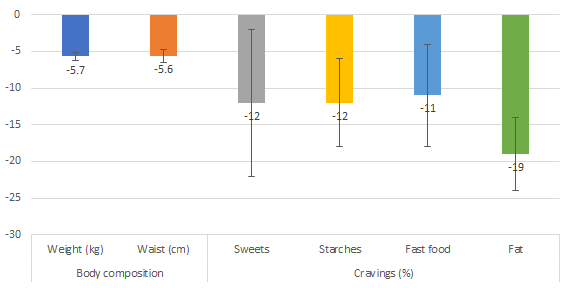 In fact, after weight loss, cravings for sweets and starchy foods were reduced by significant 12±10% (P=0.02 | low effect size, though) and 12±6% (P<0.01 | medium effect size), respectively. What is particularly interesting is that the reduction in sweet cravings tended to be associated with a reduction with significant reductions in disinhibition and increases in cognitive restrained: over time, the subjects were thus more and more able to control their food intake and less susceptible to fall victim to their (now reduced) cravings - reduced cravings for sweets and starches and reduced cravings for fatty foods (11±7% | P<0.03) and fast food cravings (19±5% | P=0.0006), all without the often-heard-of difference between men and women (you know how women are supposed to crave sweets, and men fatty foods). Bottom line: The study provides valid evidence for the commonly heard claim that low-carbing would reduce food cravings. It does not, however, prove that a similar effect wouldn't have been observed simply due to weight loss with other diets. Do the scientists mention that in the conclusion to the abstract, the only part of a paper many people read? Obviously not. Without a follow-up study that compares the effects of a low-carb to an energy-equivalent control diet (ideally one that's high(er) in satiating proteins), the study at hand must be considered preliminary evidence. Evidence that is, however, in line with the reports of many (formerly) obese low-carb fans all around the world - reports from lean individuals and athletes, as well as the results of studies comparing low- and high-carb diets head to head (e.g. Brehm 2003; ), on the other and, are much more inconsistent and suggest that metabolic, genetic and/or lifestyle differences may determine whether low-carbing will curb your appetite | Comment! Brehm, Bonnie J., et al. "A randomized trial comparing a very low carbohydrate diet and a calorie-restricted low fat diet on body weight and cardiovascular risk factors in healthy women." The Journal of Clinical Endocrinology & Metabolism 88.4 (2003): 1617-1623. Heimowitz, Colette, et al. "Changes in Food Cravings during Dietary Carbohydrate-restriction." The FASEB Journal 31.1 Supplement (2017): 643-23.